What comes as a fascinating fact is that Honda Motors had recently unveiled the fifth iteration of one of the best selling two-wheelers in India. Honda Activa 5G Deluxe made its debut at the Auto Expo 2018 in the country. Reportedly, the price of the all-new Honda Activa 5G variants starts from Rs. 56,000/- onwards. The company has introduced an array of changes when we compare the Deluxe model with that of the base model i.e. the Standard variant. What is DLX and STD in Activa 5G? Activa 5G STD vs DLX: What you will get? Talking about the Deluxe trim, this variant falls on the top-end spectrum of the models. 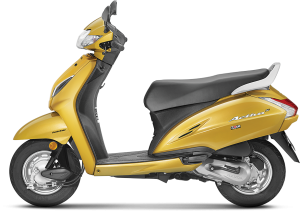 The price of the Honda Activa 5G Deluxe edition starts from Rs. 58,000/-. For the two-wheeler enthusiasts out there, there is an all-new instrument cluster which is coming handy with the Deluxe trim. An eco speed indicator has been introduced as well as a service due alert. The much-informative all-new digital-analog hybrid instrument console is breaking the stereotypes. You might observe new chrome highlighting as well as an exhaust cover when you compare the Deluxe variant with that of the Standard trim. The headlight has been redesigned, the vehicle model now supports an all-LED light. Other valuable features that have been introduced by the Honda Motors are front hook, 4 in 1 lock, a seat opener switch as well as a retractable rear hook. Digging deep into the mechanical specifications, both, Honda Activa 5G Deluxe as well as Standard trim have a 109.2 cc engine with a solo cylinder. The maximum power of the engine stands at 8 bhp which has been clocked at 75000 rotations per minute. Talking about the torque, the engine produces a torque of 9 Nm @ 5500 rotations per minute. Fuel tank capacity of both the trims stands at 5.3 L. Led headlamp as well as a position lamp is available in the Deluxe trim. The same is absent in standard. Apart from considerable changes in looks, there aren’t any mechanical changes. The Honda Activa 5G Deluxe is meant to cater to the alluring appeal demands of the users. The company is trying to woo the young user segment of the country with useful features and enhanced design specs. If we talk about Activa 5G DLX and STD mileages, well it would be same for both.